We want you to be confident with your Novori diamond purchase. On these Diamond Education pages you will learn diamond basics and what to look for before you make a diamond purchase. We offer top quality independently certified diamonds. If you still have questions, call our toll free number and a diamond specialist will gladly help answer your questions. A diamond truly is a unique gemstone. The word diamond comes from the Greek word adamas which means unconquerable. Nothing compares to the hardness of a loose diamond. The diamond is the king of gemstones because of it's rareness, optical qualities and hardness. Novori only sells only natural, certified loose diamonds that meet strict quality standards. We even reject diamonds that other online dealers may sell because we want you to be absolutely sure that you have a quality gemstone with impeccable quality. We never sell enhanced diamonds, only natural stones. That is how we are able to ensure your total satisfaction and provide a no hassle, 30 day exchange policy with all Novori loose diamonds. We can help you find the right diamond that will provide a lifetime of enjoyment for your life partner. Your appreciation of diamonds will come from your understanding of the 4 C's known as Cut, Clarity, Color and Carat-weight. Our first step is to explain what these are. Of the 4 C's, the diamond's cut is the most important factor in determining its brilliance and beauty of a diamond. There are many shapes that diamonds are cut to but a diamonds cut refers to how well proportioned the diamond has been transformed into its shape. The shape of a diamond can be round, oval, pear, heart, marquise, emerald or princess. When speaking of a diamonds 'cut grade', we are referring to its proportions, symmetry and polish. Novori will not sell diamonds with a cut grade considered less than very good. Ideally, the cut of the diamond is done in a way to best reflect the light that shines into it. This is what produces the sparkle and fire we see in a beautifully cut diamond. GIA grading reports show depth % and table % ratios as compared to the width of the diamond. A good table cut should be 53-64% and a good depth cut is 58-64%. If the cut is outside of this range the diamond is considered to be cut too deep or too shallow. If the diamond is cut too heavy, or too shallow, most of the light entering into the crown is released through the bottom of the pavilion resulting in an overall dull appearance. An ideal cut diamond on the other hand, returns most of the light that enters it back through the crown giving it a very satisfying sparkle effect. Every diamond will range in color from clear to yellow. The most valuable diamonds will have very little color. Color in a diamond will act as a filter for the light passing through and degrade the spectrum of light emitted, making it show less sparkle. The grade of color is usually represented by the GIA's professional color scale which gives a letter scale from D for colorless diamonds to Z for diamonds that display a yellowish or brownish color. To maintain a high level of quality Novori will only sell diamonds with a color rating of J or better. We prefer to recommend a diamond engagement ring with a color rating of D, E or F but realize that your budget may not allow this. Most Novori customers purchase a diamond with a color rating of G, H or I because of the almost undetectable color and the value associated with these ratings. D The highest color grade and the diamond is absolutely colorless. FL Flawless - No internal or external imperfections visible using a 10X microscope. IF Internally Flawless - No visible internal imperfections, but may have minor surface blemishes visible when using a 10x microscope. VVS1-VVS2 Very, very slightly included - Inclusions that are extremely difficult for a skilled observer to locate using a 10x microscope. VS1-VS2 Very slightly included - Very small inclusions that are very difficult for a skilled observer to locate using a 10x microscope. In rare instances, with larger stones, some VS1/VS2 inclusions can be seen with the naked eye, after first being located using a microscope. SI1-SI2 Slightly included - Refers to diamonds which have small inclusions that can be easily located using a 10x microscope. In some instances, such inclusions can be seen with the naked eye, after first being located using a 10x microscope. Diamonds with a clarity grade of Flawless or Internally Flawless and are very rare and almost always expensive. The fewer inclusions found in a diamond, the more valuable and expensive it becomes. When choosing a diamond, you should select a clarity grade in which the inclusions are not visible without magnification. This is probably the most common criteria shoppers are aware of. The carat weight of a diamond is simply the weight of the diamond. A carat is a unit of measurement and 1 carat is equal to 200 milligrams or 0.2 grams. Hence a 1.25 carat diamond will weigh 250 milligrams. The value of a diamond comes partly due to the fact that larger diamonds are found far less often than smaller diamonds. This means that the price of a diamond will increase exponentially as the carat size of the diamond increases. All other things being equal, a 2 carat diamond will always be worth more than two 1 carat diamonds. The most common size of diamond that Novori sells is between 0.6 carats and 1.25 carats in size. This range of diamond has the best size for value ratio and is easily fitted in most pieces of jewelry. The size or carat weight of a diamond cannot be used alone to determine the value of a diamond. A large diamond will not be as valuable if it does not show good color, a fine cut or excellent clarity. All factors (cut, color, clarity and carat weight) are used together to determine the value of a diamond. A common misconception is that a 2 carat diamond will look twice the size of a 1 carat diamond. Since the carat of a diamond refers to its weight, a 2 carat diamond will not be 2 times the size of a 1 carat diamond but it will be twice the weight. A 0.5 carat round diamond has a diameter of approximately 5.2mm while a 1.0 carat round diamond has a diameter of approximately 6.5mm. When choosing the carat size of your diamond, remember to keep a good balance between size and quality. If you are looking for a larger carat diamond, you may have to lower the color or clarity of the diamond as a trade off to the size. Polish abrasions are visible with the naked eye. This rating will impact the quality of the stone and these diamonds are not sold by Novori. Diamonds that have a rating of Excellent or Very Good will not affect the appearance or value of the diamond. Novori is dedicated to providing quality certified diamonds to our customers and therefore we do not sell any diamonds that have a polish rating of Fair or Poor. Our standards are higher for your protection. Fluorescence is the effect of a diamond to give off light when exposed to ultraviolet light. Some diamonds give off light when exposed to ultraviolet light and some do not. Under normal lighting conditions, this effect is not discernable to the eye. There is still some controversy over whether fluorescence is beneficial or detrimental to a diamond's value. In some cases, depending on the clarity and color of a diamond, fluorescence will make the diamond appear whiter. When you order your diamond from Novori we will discuss this further with you. The GIA laboratory certificate will indicate if a diamond has fluorescence. Follow this link for more details on what is fluorescence? To ensure the value of a diamond has been properly determined, an independent laboratory will inspect and write a report on each individual diamond. These reports include a physical inspection of the diamond and a written report called a grading report or diamond dossier, which will accompany the diamond. A gemologist will place the diamond under a microscope and carefully determined its proportions, color, symmetry, fluorescence, cut, clarity and carat weight. This inspection can take 30 to 60 minutes to complete. 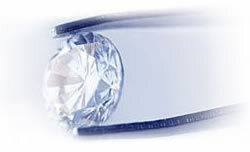 At Novori, we prefer diamonds certified through GIA, AGS or EGL (USA). These laboratories have an excellent reputation in the North American market for providing accurate and consistent un-biased reports. To avoid disappointment in the diamond you purchase, you should always insist that a grading report from an independent laboratory be part of your purchase. All loose diamonds purchased from Novori Jewelry will be accompanied with their grading certificate. Diamonds that are mined today were born more than 1000 million years ago. Highly pressurized carbon formed this seductive and valuable mineral in the earth at depths over 150 kilometers and at temperatures greater than 10,000 degrees Celsius. In dramatic geological events within the earth's core, melting fluids far underneath the Earth’s surface were pushed violently to the surface, causing volcanic eruptions. These explosions created conical pipes filled with kimberlite, or hardened volcanic rock. Once the original volcanic cone was removed by gradual erosion, the kimberlite pipes containing diamond is exposed. Diamonds are in fact only accidental fragments brought to the surface of the earth hidden within this kimberlite rock. What About Man Made Diamonds? There are companies that are manufacturing man made diamonds that look, feel and share many characteristics of natural diamonds. Although the process to manufacture a diamond in a controlled environment is always being refined, the fact remains that they are not real, natural diamonds - they are in fact man made diamonds. They are imitations as they imitate the qualities and characteristics of a natural diamond. There are cheap imitation diamonds out there which will not impress anyone and there are some that are quite good, but are almost as expensive as the real natural diamond. If you are looking for a symbol like a diamond to represent the love that you share with a special someone, wouldn't you want that symbol to be as real as your love? Novori will only sell high quality, natural certified diamonds and can find you a real, natural diamond within your price range. To ensure your diamond is an untainted symbol of love, we are committed to selling only conflict free diamonds. Conflict free diamonds are diamonds that have been mined in countries where there are no conflicts or civil wars and most of these countries adhere to a stringent regulation to control the exportation of diamonds called the Kimberley Process. Click here to find out more on what are conflict free diamonds. Don't be confused by the information shared here about diamonds. This diamond education page should provide you with some knowledge to help you select and purchase a loose diamond online. We have more diamond information available but if you need assistance with selecting the perfect diamond, just call us toll free at 1-877-877-4141. We are ready to assist you in your diamond search.